Since returning from our holiday I have been enjoying a busy time painting commissioned works. 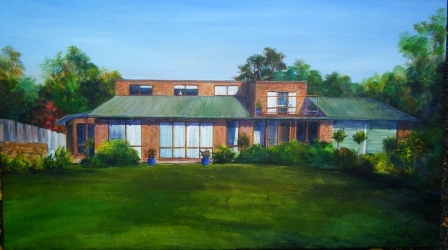 The house is an acrylic on canvas which I drew up and started to paint before leaving as I knew it needed accurate drawing to meet the requirements. It is a medium sized work, in acrylic on stretched canvas (a stretcher I made in proportions to suit). The amount of green with the expanse of grass in front was daunting but shadowing helped and the delightful blue pots added a lively contrast. I even included (as requested) the pelican statue hiding behind some of the low shrubs. The blue wren is an illustrative style watercolour and inktense pencil work which I was working on as a demo at Penguin Market last Sunday. 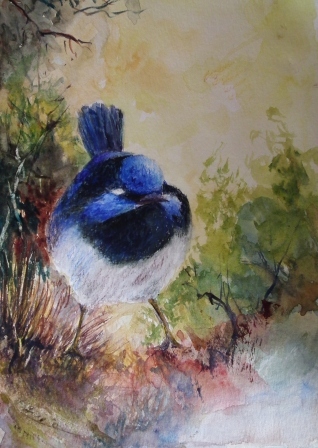 The background was painted wet-in -wet and is completely imaginary as the blue wren was photographed standing on our barby. I have yet to paint in the eye then another blue wren commission which will be different. 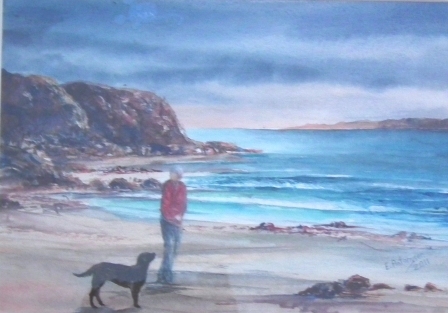 Finally is a coastal scene which I was instructed to paint similar to one I had on display but with the inclusion of the commissioner’s wife in a red jacket (stance based on a photo supplied) and a black labrador cross dog looking up at her.